Watch this dramatic video of an alleged unarmed peaceful man from the village of Karrana in Bahrain shot as he approaches soldiers. Video of Bahrain security forces attacking protesters in the capital city of Manama. Bahrain hosts the US Navy 5th Fleet with some 6000 American personal based there. The king of Bahrain has declared a state of emergency across the country for three months. Local police are now being backed up by 1,000 Saudi troops, who entered the country on Monday following weeks of political unrest. Among those wounded in violent protests are undercover police found in the Shia areas of Bahrain, where hospital staffers are overwhelmed by the influx of the injured. MANAMA (Reuters) - Saudi Arabia sent troops into Bahrain on Monday to help calm weeks of protests by the Shi'ite Muslim majority, a move opponents of the Sunni ruling family on the island called a declaration of war. A prominent Bahraini opposition leader, Hassan Mushaima, has returned to his country from self-imposed exile in the UK. The return of the senior Shia figure comes after the government dropped charges against him as one of several concessions made to protesters. He was greeted by a crowd of supporters waiting at the airport to receive him. Last Friday, at least 50 people have been injured as security forces in Bahrain opened fire on protesters for a second straight day. Protesters who tried to march to the square on Friday described a chaotic scene of tear gas clouds, bullets coming from many directions and people slipping in pools of blood as they sought cover. Some claimed the gunfire came from either helicopters or sniper nests. The video shot by RT crew shows chanting protesters marching towards military vehicles before sustained gunfire erupts. Throngs of anti-government protesters took over the square earlier in the week, setting up a camp with tents and placards, but they were driven out by riot police in a deadly assault on Thursday that killed five people and injured more than 200. In Bahrain, thousands of people have returned to Pearl Roundabout, the centre of anti-regime protests and the scene of two separate attacks by security forces. But police and soldiers have now left the area and the government says talks with opposition groups are under way. Al Jazeera's James Bays reports from Manama where many protesters say they won't be attending. Bahraini security forces have opened fire on anti-government protesters gathered in the capital, Manama. Hundreds of mourners were marching towards Pearl Roundabout when government forces fired live rounds and tear gas at them on Friday. The wounded were taken to the city's Salmaniya Hospital, where protesters have gathered to offer blood and support. On Friday evening, Bahrain's king asked his crown prince to begin a "national dialogue" with all parties over the continuing unrest in the country. Al Jazeera's correspondent, who cannot be named for security reasons, reports from Manama. 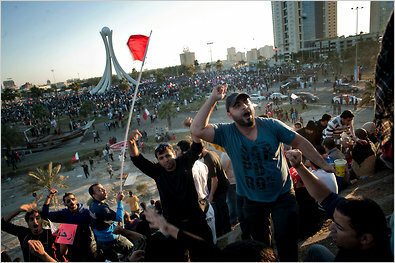 Protesters reassembled in Pearl Square in Manama, Bahrain, on Saturday after the government security forces withdrew. Thousands of jubilant protesters surged back into the symbolic heart of Bahrain on Saturday and the monarchy called for peace after two days of violent crackdowns. Ultima hora: Rey de Bahréin encarga al heredero que inicie un diálogo..
El rey de Bahréin encarga al heredero que inicie un diálogo "con todas las partes"
Bahrein: ¿Qué hay en juego para Estados Unidos?